Added support for AvroSerDe and OpenCSVSerDe, US East (Ohio) Region, and bulk editing columns in the console wizard. Improved performance on large Parquet tables. US East (Ohio) Region (us-east-2) launch. You can now run queries in this region. You can now use the Add Table wizard to define table schema in bulk. 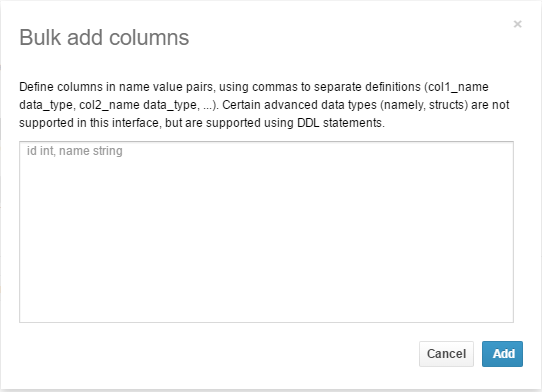 Choose Catalog Manager, Add table, and then choose Bulk add columns as you walk through the steps to define the table. Type name value pairs in the text box and choose Add. Improved performance on large Parquet tables.